A fine antique George V cut-glass and English sterling silver mounted decanter; part of our wine and drinks related silverware collection. This fine antique George V sterling silver mounted, cut glass decanter has a square tapering form with rounded corners and shoulders. 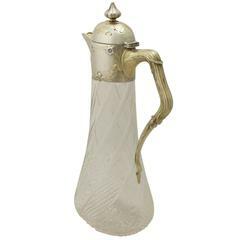 The cylindrical neck of the decanter is fitted with the original plain hallmarked sterling silver mount and circular rounded hinged cover with bayonet fitting. 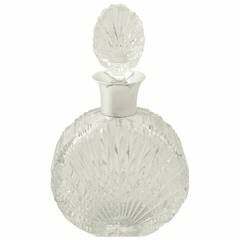 The glass body of the decanter is embellished with impressive cut glass stemmed floral designs. 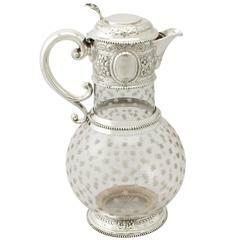 The decanter is further ornamented with a cut glass star motif to the underside. Dimensions Height 23.5cm/9.25" Diameter of cover 3.7cm/1.5" Width of shoulders 6.5cm/2.6" square Width of base 8.9cm/3.5" square Condition The mount of this antique cut glass decanter is a very good gauge of silver, fine quality and in excellent condition. Full hallmarks struck to the surface of the mount are all very clear. Maker: Walker & Hall Origin: Sheffield, England Date: 1927 Video: A video of this fine piece is available upon request. Reflections in photography may detract from the true representation of this fine antique cut glass decanter. Oozing quality is this original 1930s Art Deco decanter in thick cut-glass with enamel decoration. Quite weighty for it's size. Condition is excellent with no flaws or damage to note.